The LG WT7500CW is a top performer where it counts: In cleaning your clothes. At 5.2 cubic feet, it's a great fit for even the king-sized comforters, so you'll never have to schlepp them to the laundromat. Good, for a top loader. If you're a very hands-on laundry doer who likes lots of presets, you'll love the LG WT7500CW. It's plenty big, with a 5.2 cubic-foot capacity that users say can handle even king-sized comforters. And, when it comes to cleaning, the WT7500CW is a standout performer. Jonathan Chan at Reviewed says that it, "doesn't skimp on water or speed, but still gets clothes clean." Consumer Reports gives it good scores in general, although they don't give it a Recommended nod (only one top-loader is Recommended there, and it's since been discontinued). Still, the WT7500CW earns Very Good scores there in all washing performance metrics, and an overall score of 70 out of 100 -- the only washers that score higher get scores of 72 and 71, and most of them have been either discontinued or recalled. However, the WT7500CW gets only a score of Good on the delicate cycle -- something to be aware of if you have a lot of dainties. Chan also calls it out for roughness on some clothes, and says that, while it does a great job in general at cleaning and was excellent at getting out common household stains like protein, cocoa and red wine, it didn't perform as well on tough oil stains, so, if you're a mechanic, this might not be the best choice for you. Owners have very few complaints, though, giving this washer a lot of love. Most say it does a terrific job and they're overall very pleased with it. We saw virtually no complaints about cleaning performance; unhappy customers were generally unhappy about other things. An energy sipper. Although no top loading washing machine will ever be as efficient as a front-loader, the LG WT7500CW is better than most. It's Energy Star Qualified and the estimated yearly energy cost is only $16. At Reviewed they add up electricity, hot water and cold water costs, and estimate a total average of $61 per year to operate. As with most High Efficiency (HE) washers, the load sensors "sense" the size of the load (and the amount of dirt based upon the load options chosen) and use the minimum amount of water necessary for cleaning, although there is an option to add water if you feel it's not using enough in a load -- something users appreciate. Tweak to your heart's content. There are so many wash options and presets on the LG WT7500CW that you can just toss in a load, press a button and go, or you can endlessly tweak the cycles to customize them to your heart's content. Experts and owners both praise the super-fast, 30-minute TurboWash function, which significantly shortens cycle times, and the steam cycle that is beloved by those who need to quickly steam out wrinkles and by parents of children who use it to steam stuffed toys and refresh bedding. Lots of washer for the price. Experts and owners agree that the LG WT7500CW, which can often be found for less than its MSRP, is a good value when you consider the important things: performance, size and features. In fact, in his review, Chan concludes that, "it performs up to its price point." 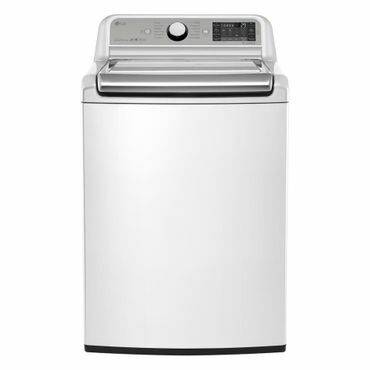 It is only available in white; it's matching electric dryer is the well-reviewed LG DLEX7600WE (Est. $1,050) and the gas version of that dryer is the LG DLGX7601WE (Est. $1,150). We saw few durability complaints, but, just in case, LG backs the WT5680HVA with a one-year warranty on parts and labor, 10 years on the motor, and lifetime on the drum. The right combination of features. Washing performance for your lifestyle.